The theory of ecologically unequal exchange (EUE) posits that international trade is structurally organized in a manner that allows a net transfer of resources from peripheral developing to core industrialized countries. The consequence, it is argued, is under-development in the periphery and augmented productive capacity in the core. EUE thus challenges the neoliberal free-market argument that exchange at market prices is symmetric and fair. 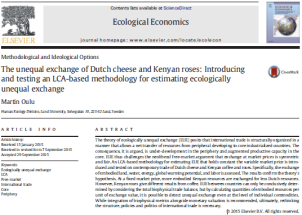 An LCA-based methodology for estimating EUE that holds constant the variable market price is introduced and tested on contemporary trade of Dutch cheese and Kenyan coffee and roses. Specifically, the exchange ofembodied land,water, energy, global warming potential, and labor is assessed. The results confirm the theory’s hypothesis. At a fixed market price, more embodied Kenyan resources are exchanged for less Dutch resources. However, Kenyan roses give different results fromcoffee. EUE between countries can only be conclusively determined by considering the total biophysical trade balance, but by calculating quantities of embodied resources per unit of exchange value, it is possible to detect unequal exchange even at the level of individual commodities. While integration of biophysical metrics alongside monetary valuation is recommended, ultimately, rethinking the structure, policies and politics of international trade is necessary.